What is the largest size tap that you can do on my 12" carbon steel main? We can tap size on size on any pipeline material except concrete cylinder pipe. Can you tap a steam line or a natural gas line? We can tap lines containing anything and everything except oxygen. My main is in a ceiling. Can you do a tap off the bottom of the pipe? We can perform our services 360 Degrees around the main provided the fittings are installed square and perpendicular to the main. What is the difference between a Pipe Freeze and a Line Stop? Both services accomplish the same end result by providing a temporary shut-off allowing you, the customer, to make repairs, alterations or relocations without shutting the entire system down. Pipe Freezes can only be accomplished if there is no flow and the line is full. Should you have flow or if the line is not full then a line stop can be performed. How does the high pressure and flow affect a Pipe Freeze? 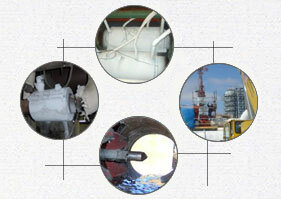 The working pressure does not affect the success of a pipe freeze. On a high pressure line equal pressure must be applied on both sides of the ice plug once the customers work is completed. Flow (including movement, turbulence and convection) will affect the success of a Pipe Freeze. For a complete ice plug to form the line must be full and there must be no flow in the line. Can you Pipe Freeze a line that has glycol in it? The ability to Pipe Freeze a line containing glycol is based on the concentration and type (ethylene/green or propylene/pink). Please call our office for more details. How do we know whether we should use a line stop or a valve insertion? You need to determine whether you need a temporary or permanent service. A line stop is a temporary service, although the fitting left in place can usually be used for a restop. An in-line valve insertion is a permanent service. What is the difference between a Hot Tap and a Wet Tap? The services are the same. They both provide branch connections. The difference lies in the pipeline material. Hot taps are performed on carbon, galvanized and stainless steel, brass, copper and several other pipeline materials. While this is normally a welded application, in many cases we can provide a bolt-on application. Many people call the service a "Wet Tap" because the product in the pipeline is often a liquid; for example chilled, condenser or hot water. Wet taps are performed on cast and ductile iron, transite, concrete cylinder pipe and several other pipeline materials. As you cannot weld these materials, wet taps are bolt-on applications. The mains generally transport water or sewer. What parts of the United States does Pro Tapping service? Pro Tapping services the entire United States including Alaska and Hawaii.